Launch has been re-set for Saturday night with T-0 at 10:30 p.m. local time; 5:30 UTC on Sunday. A powerful Atlas V rocket sporting four boosters will light up the night over California late on Thursday, aiming for liftoff from Vandenberg Air Force Base at 5:38 UTC on Friday with the classified NROL-42 satellite for the U.S. National Reconnaissance Office, believed to be an eavesdropping and missile-tracking spacecraft working from a highly elliptical orbit in a system of orbiting listening posts operated by the U.S.
Thursday night’s launch is the third NRO mission in 2017, following up on the launch of a pair of NOSS ship-tracking satellites in March and the mysterious NROL-76 that launched atop a SpaceX Falcon 9 in May and entered an uncharacteristic Low Earth Orbit, likely to test out new sensor technology. Two more NRO launches are on ULA’s manifest for 2017 after this week’s launch with the NROL-52 data relay satellite next on the company’s Cape Canaveral manifest and NROL-47 – likely a radar surveillance satellite – targeting a mid-December blastoff from Vandenberg. NROL-42 had been targeting a September 14 liftoff, but was pushed one week to allow United Launch Alliance employees to travel back to Florida to prepare for hurricane Irma that had threatened to impact Cape Canaveral as it made its way north along the Florida Peninsula. The decision to delay the launch was to allow employees to prepare their homes and evacuate their families. Targeting a 10:38 p.m. local time liftoff, Atlas V will race off from Space Launch Complex 3E at Vandenberg under the power of its two-chamber RD-180 main engine and four Solid Rocket Boosters to deliver the initial kick needed to reach the classified orbital destination. Swinging to the south east, Atlas V will be flying on a coast-hugging trajectory for the initial portion of its mission, dropping the boosters just over a minute and a half into the flight. The protective payload fairing will be split from the climbing rocket three and a half minutes into the mission and the first stage will hand off to the Centaur upper stage just past the T+4-minute mark to finish the boost into orbit via a two-burn flight profile. 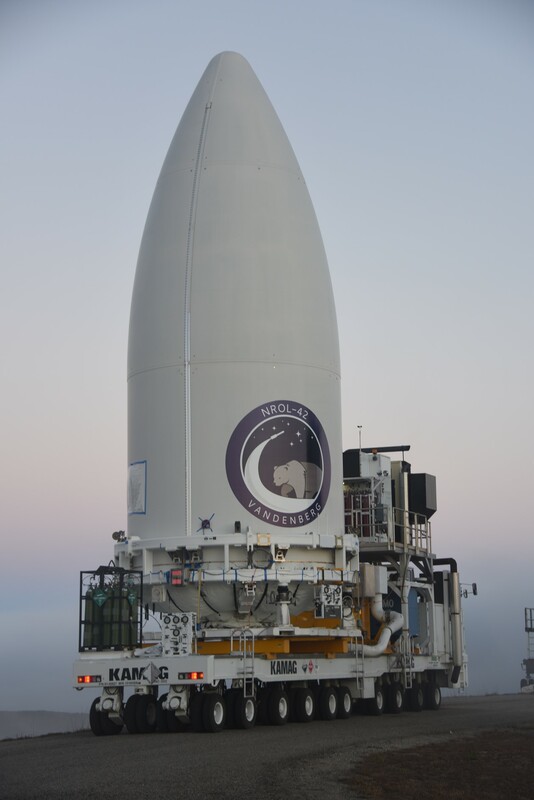 As is typical for classified NRO missions, live coverage of Thursday night’s launch will end at the moment of fairing separation and no details on the satellite, its target orbit and intended mission will be released. 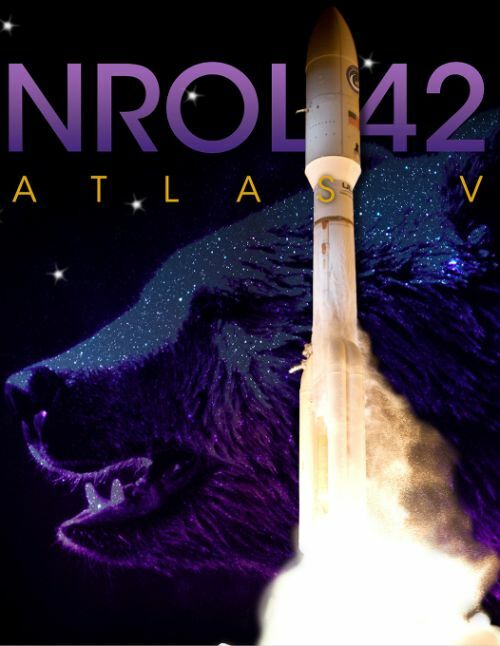 The last to be heard of NROL-42 will be a confirmation of launch success after the satellite separates from the Atlas V booster, expected around an hour or hour and a half after launch based on previous missions. What is hidden under Atlas V’s five-meter payload fairing appears to be a high-fidelity electronic intelligence satellite flying under the code name Trumpet and tasked with vacuuming up vast amounts of communications and signals. Placed into a highly elliptical orbit peaking over the northern regions, the Trumpet satellites complement eavesdropping birds in Geostationary Orbit by providing improved coverage in the high-latitude regions where viewing angles from GEO are not favorable. 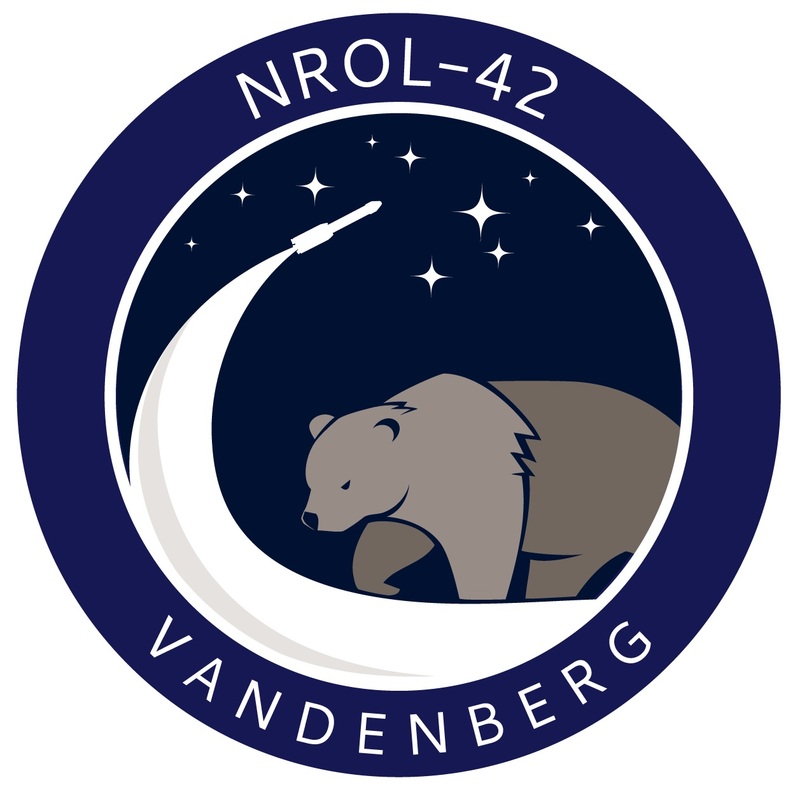 The conclusion on NROL-42’s identity is based on two major pieces of information – the type of launch vehicle in use for the mission and the target orbit that can be gleaned from navigational warnings issued for the launch. Atlas V 541 – sporting four SRBs and a five-meter fairing – is the second most powerful Atlas V version currently in operation and was only used four times to date with NASA’s Curiosity rover, the GOES-R weather satellite, NROL-67 and NROL-35. All of these, except NROL-35, occurred from Cape Canaveral, placing the NROL-42 satellite in the same group as NROL-35 launched back in December 2014. 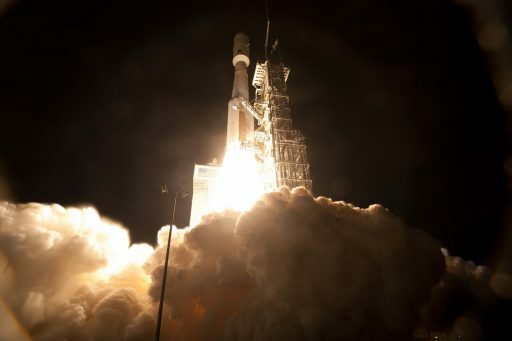 NROL-35 had been suspected to be a new type of Trumpet signals intelligence spacecraft prior to its launch, a theory eventually confirmed by satellite observers finding the vehicle in a highly elliptical Molniya Orbit, inclined 63 degrees. 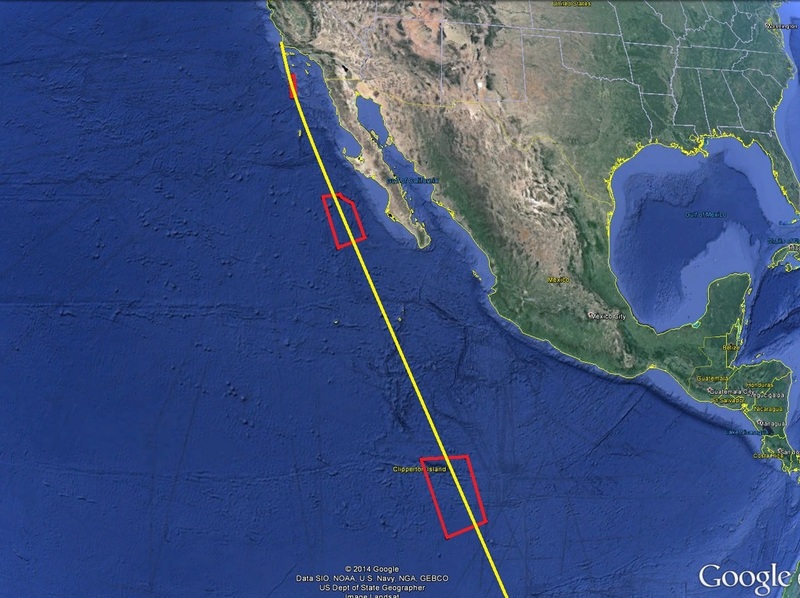 Navigational warnings for NROL-42 closely match those of NROL-35, strongly suggesting the two missions are of similar type. 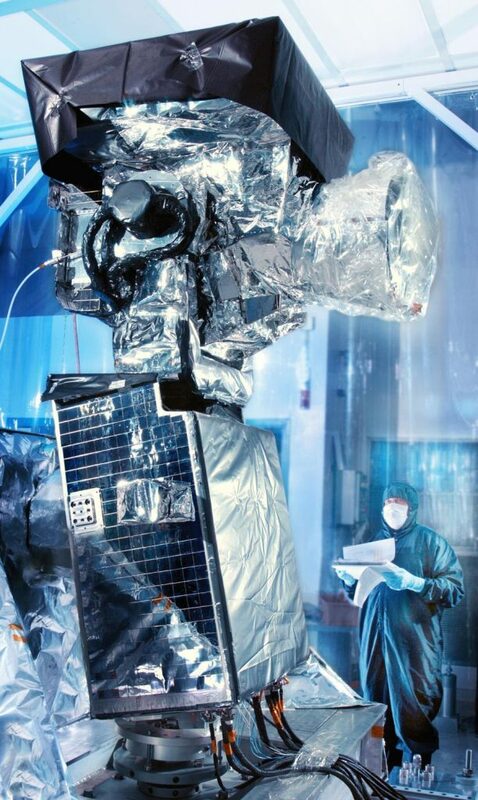 Another common element for the Trumpet HEO satellites is them acting as host spacecraft for the highly-elliptical orbit payloads of the Space-Based Infrared System (SBIRS) which uses stand-alone spacecraft in Geostationary Orbit and hosted payloads in Molniya orbits to detect and track missile launches across the globe. 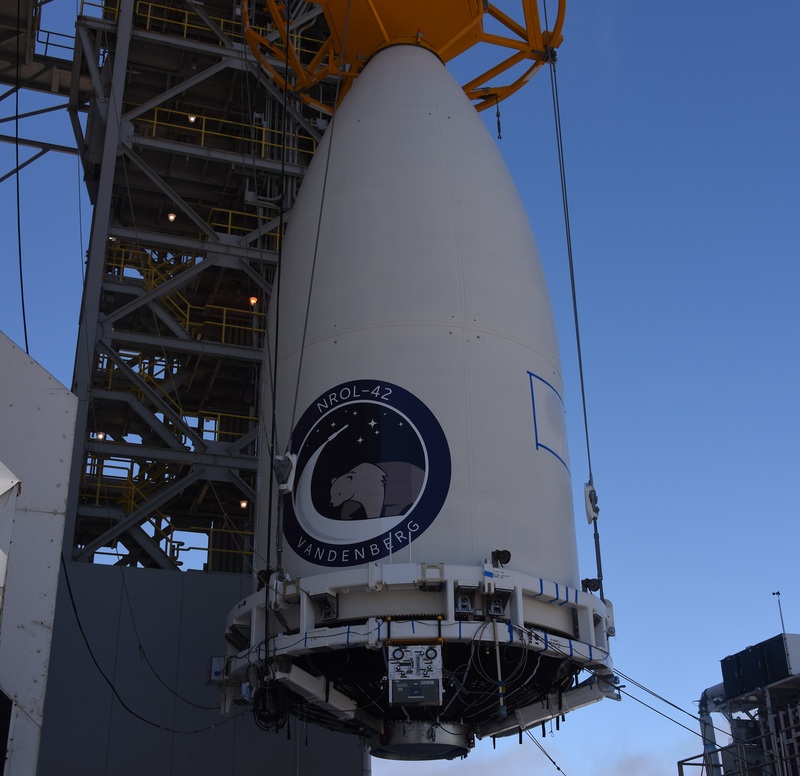 Responsible for the SBIRS HEO instrument, Northrop Grumman reported in June 2015 that the HEO-4 payload had been shipped for integration with its host – in-line with a two-year satellite assembly and testing schedule. Satellite-based signals intelligence, along with image reconnaissance, build the most critical cornerstones in modern intelligence gathering. The U.S. in particular has a long history of in-space signals collection, starting out in the late 60s when the NRO launched its first series of communications intelligence craft known as Canyon, featuring ten-meter dishes to listen in on VHF and microwave communications from a near-Geostationary Orbit. The desire for optimized and full collection over the Soviet Union, including its northern regions, prompted the inauguration of a second constellation segment, code named Jumpseat, with satellites in elliptical orbits to have at least one craft at high elevation over the regions of interest at any given time to characterize radar signals, capture microwave communications and record telemetry from missiles and re-entry vehicles. At present, the NRO operates a number of Orion satellites drifting in Geostationary Orbit to collect communications and characterize all types of radio emitters on the ground. 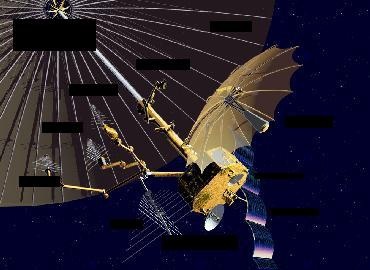 Other geostationary listening posts are flying under the Nemesis Program to capture entire satellite up-links, tasked by input from the NSA and CIA. Trumpet, as the primary collection post in Highly Elliptical Orbit, was inaugurated in the 1990s and transitioned into its first follow-on stage in 2006/08 and a second follow-on program whose code name is unknown started with NROL-35 in 2014. There have been reports that the Trumpet FO-2 satellites are substantially different than their predecessors in terms of technology but their overall mission architecture remains the same – complementing the Orion satellites in GEO by collecting a variety of signals intercepts over the northern hemisphere through a very large deployable antenna. The first Follow-On generation flew on the much smaller Atlas V 411 with only one booster and a four-meter fairing, suggesting the FO-2 satellites have significantly grown in mass. Thursday night’s launch will be the fifth for Atlas V in 2017 and the sixth for United Launch Alliance. The night’s window duration is unknown. Meteorologists have issued a 60% chance of favorable conditions with ground winds and launch visibility being the primary concerns as a deep trough moves over the range on Thursday and causes stronger surface winds when interacting with the marine layer. Gearing up for a late night liftoff, Atlas V will enter countdown operations eight hours ahead of the opening of its launch window with initial vehicle power-up followed by a multi-hour checkout campaign to fully verify the electrical systems and communications link with the rocket. The Mobile Service Gantry will be rolled back five hours prior to T-0 to enable final pad close outs to occur before Atlas V heads into tanking after the countdown comes out of a planned hold at T-2 hours. 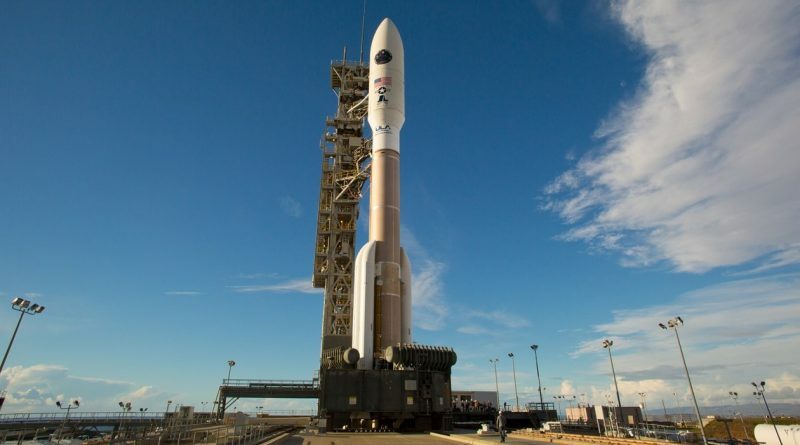 Already loaded with its dose of Rocket Propellant-1, Atlas V will receive -183°C Liquid Oxygen and -253°C Liquid Hydrogen over the course of a 90-minute tanking sequence. The RD-180-powered first stage will hold a total of 284 metric tons of Kerosene & LOX while the Centaur Upper stage will be filled with some 21 tonnes of cryogenics. A final hold is scheduled at T-4 minutes to allow teams to catch up with any open items and assess the status of the launch vehicle, payload and western range as part of the final pre-launch poll. Ticking back from T-4 minutes, the highly choreographed countdown sequence will put Atlas V through the transition to internal power, the arming of the Flight Termination System, the pressurization of tanks and the handover of control to the vehicle’s computers. The Russian-built RD-180 engine will start breathing fire three seconds ahead of liftoff, putting out a whopping thrust of 392-metric ton force. Atlas V will catapult off its launch pad with a total thrust of 1,080-metric-ton-force when the four Solid Rocket Boosters fire up at the moment clocks reach zero. Atlas V will enter its pitch and roll program six seconds after liftoff to align itself with its ascent path to the south east, flying along the Californian coast. Based on the performance of the 541 version, Atlas V will pass the speed of sound just 35 seconds after liftoff and encounter Maximum Dynamic Pressure 45 seconds into the flight. The four solid-fueled boosters will each consume 41 metric tons of propellant to generate 1,688kN of thrust over a burn of 94 seconds. As thrust tails off on the SRBs, Atlas V will be holding the 17-meter long boosters for another 15 seconds or so before jettisoning them in pairs. Powered by the 4,152kN RD-180 engine alone, Atlas V will continue its flight toward space, burning 1,150 Kilograms of propellant each second. Approximately three and a half minutes into the flight, the protective payload fairing will be jettisoned, exposing the NROL-42 spacecraft. At this point, the mission will enter the pre-arranged news blackout to allow the classified satellite to reach its secret orbit without the public watching. Per the typical flight design for the Atlas V, the Common Core Booster will conclude its role in the mission just after passing T+4 minutes – shutting down the RD-180 engine followed by the firing of separation pyros and ignition of small retrorockets to pull the 32.5-meter booster away from the Centaur upper stage. Centaur will then ignite its 101.8kN RL-10C engine for an initial burn aiming for a Parking Orbit followed by a coast phase and a second burn before releasing the satellite less than 50 minutes after launch. Taking the NROL-35 launch as a basis, satellite analyst Ted Molczan expects NROL-42 to show up in an initial orbit of 2,100 by 37,750 Kilometers, inclined 62.85°. Navigational warnings issued for this mission indicate the Centaur upper stage will perform a deorbit maneuver after dispatching the satellite with re-entry expected in a small corridor south west of Tasmania around nine and a half to eleven hours after launch takes place. Satellite trackers will swing into action after the NROL-42 payload reaches orbit, attempting to spot the newly launched satellite to provide final confirmation of the mission’s identity. Copyright © 2019 NROL-42 | Spaceflight101. All rights reserved.